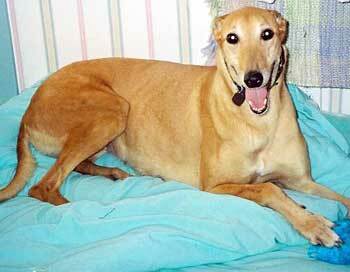 Amber is a beautiful 5-year-old red fawn female, born October 2000. Amber was found as a stray along with Cody by an animal-loving woman in the Fort Worth area. It is suspected that Cody could be Amber's puppy, judging by their ages and similar characteristics. 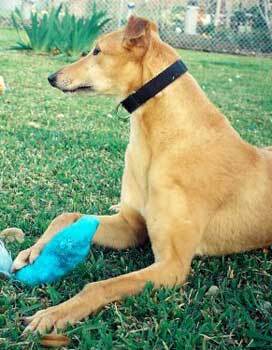 Like so many of the strays, Amber arrived positive to Ehrlichia, a tick-borne disease. She has received successful treatment for the disease. 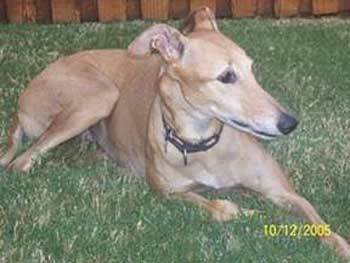 Her Ehrlichia titers indicate she has experienced exposure but she is asymptomatic. Her titers have decreased, and her CBC shows much improvement. Amber will need to be monitored annually, at least, for the rest of her life to insure the Ehrlichia titers stay low, as well as take Doxycycline frequently. Her foster mom describes Amber as quite the "tomboy" as she is a "hiker"! Amber is not cat or small animal tolerant. Miss Amber is one of the most stable, self-assured, loving dogs I have ever fostered! She is a Velcro dog, but not because of a lack of security - she just LOVES to be LOVED! She learned very quickly that her nose is good for more than just sniffing the air. It makes a wonderful "Hey, I'm right here. RUB ME!" tool as well. If she thinks I'm spending too much time on the computer, she comes over and rests her head on my lap, and if that doesn't do it, the head moves to my hands (typing becomes impossible) while she wags and looks up at me. And who can resist that?! Amber sleeps on a cushy bed on the floor beside my bed. In the morning, she waits until she's invited, then comes up and lays her head in my lap while I stroke her and talk to her. She wags and smiles and just exudes love of her own. I get as much out of that as Amber, if not more!!! This girl returns every ounce of love anyone can give and then some. Amber gets along well with my own large dogs and adored the new Basset puppy visiting his 'grandparents' next door. But she is definitely not good with cats! I have not yet had her around small, active adult dogs. Amber does not need to be crated while I am at work during the day. Before I knew she could be trusted out, she was excellent in her big wire crate. I have a doggie door, but she doesn't have access to that during the day and she's had no accidents in the house at all. Though she was a stray and appeared to have been an outside/kennel dog, Amber has adjusted extremely well to the indoors. She is one smart, savvy girl. One of her favorite things to do (other than lie with her head in my lap for loving) is to chase squirrels and run around the backyard, then just sit (yes, she likes to sit!) and gaze at her surroundings and sniff the flowers. Perhaps she's trying to show us that we should learn to do the same. A truly devoted, smart, loving girl - that's our beautiful Amber!